Home » Market Update: Gold is in a “secret bull market” that has yet to hit the U.S.
Market Update: Gold is in a “secret bull market” that has yet to hit the U.S.
Gold has lowered in recent weeks and found a level of support just south of $1,600. But that’s when measured against the U.S. Dollar. 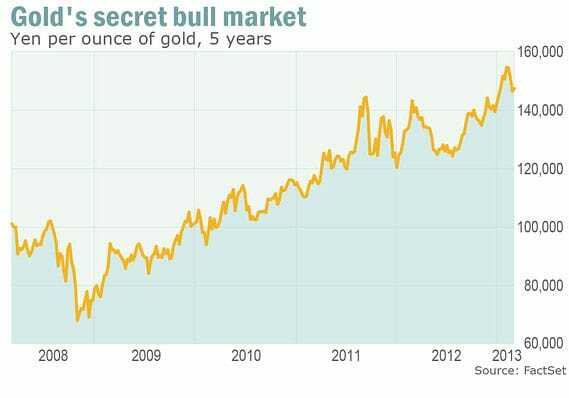 Against other currencies, for example in Japan, Brazil, Iceland, India, Argentina and England, gold is experiencing a “secret bull market” as it hits all-time highs. It’s all due to the currency wars raging around the world, with nations trying to one-up all the others by devaluing their currencies. In fact, other countries have been easing to such a strong degree that despite the Fed’s best efforts with QE Infinity, the inflation created elsewhere has amazingly outpaced what’s happening at home. That means that in strictly relative terms, the U.S. Dollar has actually strengthened… at least for now. But the Dollar’s “strength” isn’t sustainable; it’s a fiat currency, after all, and gold’s day to shine against it is approaching. With recent reports showing the highest levels of inflation in the U.S. in three years, is that day right around the corner? If you haven’t yet protected your savings from the Dollar, now is the time. Dow continues remarkable run; how will investors react to inevitable pull-back? Gold to move higher from recent support levels?